This new feature will highlight a different photo each week from the 2008 festival. For more photos from the last festival, check out Split This Rock's Flickr. Lauren Alleyne expresses Split This Rock's hope for the coming year. As you may have heard, we lost one of the world's great poet-activists this week, the South African Dennis Brutus, a fierce and beautiful advocate for justice. We were so fortunate that Dennis joined us at the inaugural Split This Rock Poetry Festival on the fifth anniversary of the war in Iraq in March 2008. 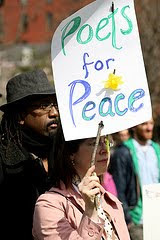 Dennis was uncompromising in his challenge to all of us in attendance: our taxes pay for the wars our government wages. What are we going to do about it? 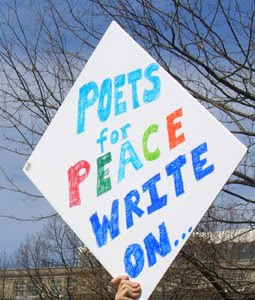 Here at Split This Rock, as we put the final touches on the second biennial festival, scheduled for March 10-13, 2010, part of our answer is that we work hard to give poets and poetry lovers a forum for speaking out, together, here in the nation's capital. Will you help us bring the vital poetry of tenderness and resistance to a diverse public hungry for authentic and visionary language? Any amount will make a tremendous difference. All donors are thanked on www.SplitThisRock.org and donors who can give $100 and above will be recognized in the festival program book. All gifts are tax-deductible through our partnership with the Institute for Policy Studies. Split This Rock mourns the passing and celebrates the life of Dennis Brutus, who shared his prophetic vision with us as a featured poet at Split This Rock's inaugural festival in March 2008. Our thoughts are with his family and with the broader human family Dennis cared about so much. We are all lucky to have been graced with his fierce, uncompromising love. 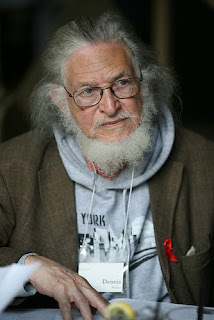 Professor Dennis Brutus died quietly in his sleep on the 26th December, earlier this morning. He is survived by his wife May, his sisters Helen and Dolly, eight children, nine grandchildren and four great-grandchildren in Hong Kong, England, the USA and Cape Town. Dennis’ poetry, particularly of his prison experiences on Robben Island, has been taught in schools around the world. He was modest about his work, always trying to improve on his drafts. His creativity crossed into other areas of his life, he used poetry to mobilize, to inspire others to action, also to bring joy. We wish to thank all the doctors, nurses and staff who provided excellent care for Dennis in his final months, and to also thank St Luke’s Hospice for their assistance. There will be a private cremation within a few days and arrangements for a thanks giving service will be made known in early January. World-renowned political organizer and one of Africa’s most celebrated poets, Dennis Brutus, died early on December 26 in Cape Town, in his sleep, aged 85. Brutus’ political activity initially included extensive journalistic reporting, organising with the Teachers’ League and Congress movement, and leading the new South African Sports Association as an alternative to white sports bodies. After his banning in 1961 under the Suppression of Communism Act, he fled to Mozambique but was captured and deported to Johannesburg. There, in 1963, Brutus was shot in the back while attempting to escape police custody. Memorably, it was in front of Anglo American Corporation headquarters that he nearly died while awaiting an ambulance reserved for blacks. While recovering, he was held in the Johannesburg Fort Prison cell which more than a half-century earlier housed Mahatma Gandhi. Brutus was transferred to Robben Island where he was jailed in the cell next to Nelson Mandela, and in 1964-65 wrote the collections Sirens Knuckles Boots and Letters to Martha, two of the richest poetic expressions of political incarceration. Subsequently forced into exile, Brutus resumed simultaneous careers as a poet and anti-apartheid campaigner in London, and while working for the International Defense and Aid Fund, was instrumental in achieving the apartheid regime’s expulsion from the 1968 Mexican Olympics and then in 1970 from the Olympic movement. 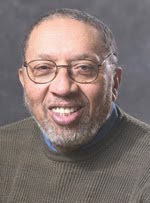 Upon moving to the US in 1977, Brutus served as a professor of literature and African studies at Northwestern (Chicago) and Pittsburgh, and defeated high-profile efforts by the Reagan Administration to deport him during the early 1980s. He wrote numerous poems, ninety of which will be published posthumously next year by Worcester State University, and he helped organize major African writers organizations with his colleagues Wole Soyinka and Chinua Achebe. Following the political transition in South Africa, Brutus resumed activities with grassroots social movements in his home country. In the late 1990s he also became a pivotal figure in the global justice movement and a featured speaker each year at the World Social Forum, as well as at protests against the World Trade Organisation, G8, Bretton Woods Institutions and the New Partnership for Africa’s Development. Brutus continued to serve in the anti-racism, reparations and economic justice movements as a leading strategist until his death, calling in August for the ‘Seattling’ of the recent Copenhagen summit because sufficient greenhouse gas emissions cuts and North-South ‘climate debt’ payments were not on the agenda. His final academic appointment was as Honorary Professor at the University of KwaZulu-Natal Centre for Civil Society, and for that university’s press and Haymarket Press, he published the autobiographical Poetry and Protest in 2006. Amongst numerous recent accolades were the US War Resisters League peace award in September, two Doctor of Literature degrees conferred at Rhodes and Nelson Mandela Metropolitan University in April – following six other honorary doctorates – and the Lifetime Achievement Award of the South African government Department of Arts and Culture in 2008. * Sirens Knuckles and Boots (Mbari Productions, Ibaden, Nigeria and Northwestern University Press, Evanston Illinois, 1963). * Letters to Martha and Other Poems from a South African Prison (Heinemann, Oxford, 1968). * Poems from Algiers (African and Afro-American Studies and Research Institute, Austin, Texas, 1970). * A Simple Lust (Heinemann, Oxford, 1973). * China Poems (African and Afro-American Studies and Research Centre, Austin, Texas, 1975). * Strains (Troubador Press, Del Valle, Texas). * Stubborn Hope (Three Continents Press, Washington, DC and Heinemann, Oxford, 1978). * Salutes and Censures (Fourth Dimension, Enugu, Nigeria, 1982). * Airs and Tributes (Whirlwind Press, Camden, New Jersey, 1989). * Still the Sirens (Pennywhistle Press, Santa Fe, New Mexico, 1993). * Remembering Soweto, ed. Lamont B. Steptoe (Whirlwind Press, Camden, New Jersey, 2004). * Leafdrift, ed. Lamont B. Steptoe (Whirlwind Press, Camden, New Jersey, 2005). * Poetry and Protest: A Dennis Brutus Reader, ed. Aisha Kareem and Lee Sustar (Haymarket Books, Chicago and University of KwaZulu-Natal Press, Pietermaritzburg, 2006). Like that. "The body is a savage," I said. For years I said that: the body is a savage. to taste this pure hunger." From Hands Washing Water (2006). Used by permission. Chris Abani's poetry collections are Hands Washing Water (Copper Canyon, 2006), Dog Woman (Red Hen, 2004), Daphne's Lot (Red Hen, 2003), and Kalakuta Republic (Saqi, 2001). His prose includes Song For Night (Akashic, 2007), The Virgin of Flames (Penguin, 2007), Becoming Abigail (Akashic, 2006), GraceLand (FSG, 2004), and Masters of the Board (Delta, 1985). He is a Professor at the University of California, Riverside, and the recipient of the PEN USA Freedom-to-Write Award, the Prince Claus Award, a Lannan Literary Fellowship, a California Book Award, a Hurston/Wright Legacy Award, a PEN Beyond the Margins Award, the PEN Hemingway Book Prize, and a Guggenheim Award. Library Journal says of Hands Washing Water, "Abani enters the wound with a boldness that avoids nothing. Highly recommended." Abani will be featured at Split This Rock Poetry Festival: Poems of Provocation & Witness, March 10-13, 2010, in Washington, DC. The festival will present readings, workshops, panel discussions, youth programming, film, activism-four days of creative transformation as we imagine a way forward, hone our community and activist skills, and celebrate the many ways that poetry can act as an agent for social change. Plan B Press will release a new print anthology in January 2010, edited by Kim Roberts, the publisher of the acclaimed online journal Beltway Poetry Quarterly. 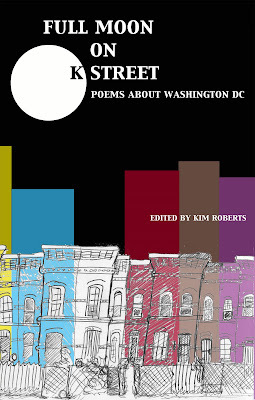 Full Moon On K Street: Poems About Washington, DC will include 101 poems, written by current and former residents of the city between 1950 and the present. Featuring over one hundred contemporary poems, the book captures DC's unique sense of place, from monuments to parks, from lawyers to bus stations, from go-go music to chili half-smokes. All poems were written between 1950 and the present, by past and current residents of the city. This anthology captures the city's many moods: celebratory, angry, and fiercely political. Preorder from Plan B Press now and get 25% off! Buy Split This Rock Books at Teaching For Change! Check out the Teaching For Change online bookstore here. 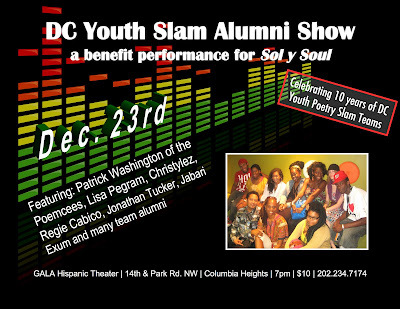 DC Youth Slam Team Benefit Show! Excerpt from “Things I Don’t Miss from My Youth” from Things I Must Have Known (2008). Used by permission. A.B. Spellman is an author, poet, critic, and lecturer. He has published numerous books and articles on the arts, including Art Tatum: A Critical Biography (a chapbook),The Beautiful Days (poetry), andFour Lives in the Bebop Business, now available as Four Jazz Lives University of Michigan Press). 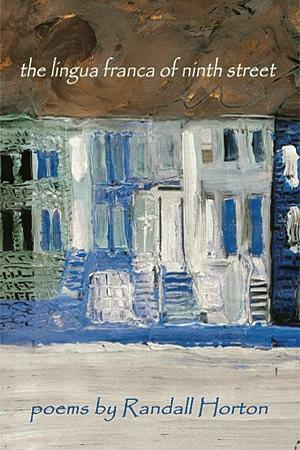 His poetry collection, Things I Must Have Known, was recently was published by Coffee House Press. Mr. Spellman has served on numerous arts panels, including the Africa Diaspora Advisory Group and the Advisory Group on the African-American Museum for the Smithsonian Institution. In recognition of Spellman’s commitment and service to jazz, the National Endowment for the Arts in 2005 named one of its prestigious Jazz Masters awards the A.B. Spellman NEA Jazz Masters Award for Jazz Advocacy. In March 2006 he received the Benny Golson Award from Howard University for his service to jazz. He was a poet-in-residence at Morehouse College, in Atlanta, Georgia, where he taught various courses in African-American culture, and at Emory, Rutgers, and Harvard Universities, where he offered courses in modern poetry, creative writing, and jazz. Spellman will be featured at Split This Rock Poetry Festival: Poems of Provocation & Witness, March 10-13, 2010, in Washington, DC. The festival will present readings, workshops, panel discussions, youth programming, film, activism—four days of creative transformation as we imagine a way forward, hone our community and activist skills, and celebrate the many ways that poetry can act as an agent for social change. Zinn Education Project: Teaching a People’s History - a new website with free, downloadable teaching activities. The Zinn Education Project, a collaborative effort by Teaching for Change and Rethinking Schools, has launched the new Zinn Education Project: Teaching a People’s History website. Thanks to the support of an anonymous donor and the Caipirinha Foundation, the site features over 75 free, downloadable teaching activities for middle and high school classrooms to bring a people’s history to the classroom. These are the best history-teaching articles drawn from the archives of Rethinking Schools magazine. The site also lists hundreds of recommended books, films and websites. The teaching activities and resources are organized by theme, time period and grade level. This is the only collection of its kind for educators – print or online — in the country. Please visit and bookmark the new Zinn Education Project: Teaching a People’s History website. Take advantage of the free resources and send your feedback. 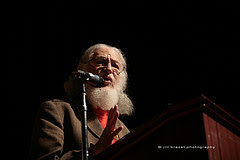 2008 Featured Poet Dennis Brutus reads. Registration is Open for Split This Rock Poetry Festival 2010! Split This Rock Poetry Festival invites poets, writers, artists, activists, dreamers, and all concerned world citizens to Washington, DC, for poetry, community building, and creative transformation as our country continues to grapple with two wars, a crippling economic crisis, and other social and environmental ills. From March 10 through March 13, 2010, the festival will feature readings, workshops, panel discussions, youth programming, film, activism –- opportunities to speak out for social justice, imagine a way forward, and celebrate the many ways that poetry can act as an agent for social change. Space is limited and registration fees increase after February 10, 2010. Please register early to reserve your spot! If you can't make it to the entire festival, one-day registrations are available. We offer a limited number of scholarships. Please read the Scholarship Guidelines and send us your application before February 20 (postmark deadline). Please contact us if you need help with registration or need registration forms in an alternate format. Featured poets are Chris Abani, Lillian Allen, Sinan Antoon, Francisco Aragón, Jan Beatty, Martha Collins, Cornelius Eady, Martín Espada, Andrea Gibson, Allison Hedge Coke, Natalie Illum, Fady Joudah, Toni Asante Lightfoot, Richard McCann, Jeffrey McDaniel, Lenelle Moïse, Nancy Morejón, Mark Nowak, Wang Ping, Patricia Smith, A.B. Spellman, Arthur Sze, Quincy Troupe, and Bruce Weigl. Read their bios here. EXTENDED SUBMISSION DEADLINE: JANUARY 15. Phil Young and Steve Fellner have been asked to co-edit an anthology for Benu Press; its working title is Love Rise Up. Both have been invested in the literary world for some time. Steve wrote and published a book of poems entitled Blind Date with Cavafy (Marsh Hawk Press, 2007) and a memoir entitled All Screwed Up (Benu Press, 2009); Phil has published in literary magazines such as Antioch Review. The focus of the anthology is on contemporary poets and poems that succeed on the following levels: 1.) The poem deals with social justice, not simply a social issue. In other words there has to be some action or suggestion of resistance or dealing with a social issue, not just having a social issue somewhere in the background. 2.) The poem offers an element of hope. This hope can be somewhat ambiguous, but at least some level of hope has to be detectable to the average reader. Think “Daybreak in Alabama ” by Langston Hughes. 3.) The poem is an “accessible narrative or lyric that contains elements of genuine drama or comedy.” 4.) If the poem were a movie, it would have to receive somewhere between a G and PG-13 rating. Phil and Steve would really like to include a poem of yours in Love Rise Up. If interested, please send us a poem(s) as a Word document to sfellner at brockport dot edu or pyoung at brockport dot edu We’d happily look at new work or previously published. The editors are responsible for paying all fees, so waivers are appreciated. Contributors will include D.A. Powell, Martin Espada (Spit This Rock Featured Poet 2008 and 2010), Denise Duhamel, Rigoberto Gonzalez, David Kirby, Sean Thomas Dougherty, Barbara Hamby, Cheryl Dumesnil, Fady Joudah (Split This Rock Featured Poet 2010), Rebecca Livingston (a past Sunday Kind of Love Feature), Alison Joseph, Laura Kasischke, Idra Novey, Eliot Khalil Wilson, Martha Collins Split This Rock Featured Poet 2010), David Baker, Jason Schneiderman, Minnie Bruce Pratt, among others. 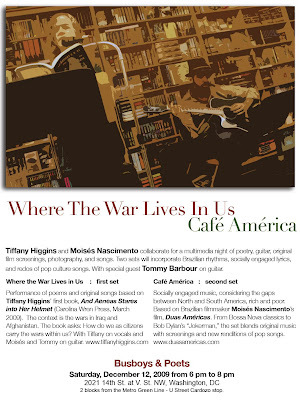 When the anthology appears (in Fall 2010, tentatively), all contributors will receive one copy. Please call 585-637-4607 or e-mail the editors if you have any questions. If you know that you will be offering something, please let the editors know by January 15. Please send this to anyone who you think may be interested. Editor Frances Payne Adler and Diana Garcia are presenting a panel discussion about the anthology and the joys of teaching social action writing at the university level with contributors Martín Espada, Patricia Smith, Alicia Ostriker, and Melissa Tuckey. Also includes contributions by past and present Split This Rock featured poets Sharon Olds, Sonia Sanchez, Carolyn Forché, and Jimmy Santiago Baca. Editor Camille Dungy is presenting a reading of contributors at Split This Rock: Gregory Pardlo, E. Ethelbert Miller, Remica L. Bingham, Thomas Sayers Ellis, and Mark McMorris. Patricia Smith and Cornelius Eady (2010 Featured Poets) are also in the anthology as are past Sunday Kind of Love features Tim Seibles, Tara Betts, Patricia Spears Jones, and Terrance Hayes, among others. Contributor Martha Collins is a Split This Rock Featured Poet in 2010 and contributor Philip Metres is participating in a panel at the 2010 festival. Other contributers include Carolyn Forché (2008 Split This Rock Featured Poet), Tamiko Beyer (2008 Split This Rock panelist) and Christi Kramer (a central Split This Rock activist). Editor Francisco Aragón is a Split This Rock Featured poet in 2010 and contributor Naomi Ayala is a member of the Split This Rock advisory board. * Books marked with an asterisk are also available via Powell's Books. Split This Rock recommends Powell's because it is a union shop. From Women Do This Every Day (1993), used by permission. Lillian Allen is an award-winning Canadian poet, fiction writer, playwright, and cultural strategist. 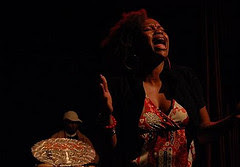 As one of its lead originators, she has specialized in the writing and performing of dub poetry, a highly politicized form of poetry, which is sometimes set to music. Her recordings, "Revolutionary Tea Party" and "Conditions Critical," won Juno awards in 1986 and 1988 respectively. Her publications include Theorize This (2004),Psychic Unrest (Insomniac Press, 2000), Women Do This Every Day (Women’s Press, 1993), Nothing but a Hero (Well-versed, 1992). Her many recordings include “Freedom & Dance,” 1999, and “Conditions Critical,” 1988. A past member of the Racial Equity Advisory of the Canada Council for the Arts, the Experts Advisory on the International Cultural Diversity Agenda, past executive member of the Sectoral Commission on Culture and Information of the Canadian Commission for UNESCO, Allen was named a Foremother of Canadian Poetry by the League of Canadian Poets in 1992. Allen will be featured at Split This Rock Poetry Festival: Poems of Provocation & Witness,March 10-13, 2010, in Washington, DC. The festival will present readings, workshops, panel discussions, youth programming, film, activism—four days of creative transformation as we imagine a way forward, hone our community and activist skills, and celebrate the many ways that poetry can act as an agent for social change. For more information: info@splitthisrock.org. Split This Rock is excited to announce the opening of our youth poetry contest, The World & Me. We invite children and youth who live or go to school in the District of Columbia to speak out and share voices and thoughts on their communities. If you are a teacher, please encourage your students to submit their work to the contest. And if you know other educators and youth counselors who could make the contest a part of their curriculum and learning activities please pass the word on to them. Additional flyers and the required application form are available here. Split This Rock seeks poems on the theme: "The World & Me." What about your neighborhood/city/country/planet makes you happy and proud? What makes you sad? If you were in charge, what would you change? Are there issues you care deeply about? Situations in the news or in your neighborhood that make you mad? Or glad? Tell us in a poem! You may also hand-deliver the poems by 5 pm on January 15. 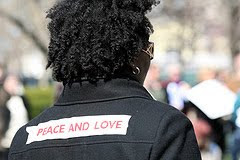 Split This Rock offers the following poems for your vigils, demonstrations, and actions. Feel free to read one or many during your event, but please always remember to say the poet's name when you read his or her poem. For more information and more poems of provocation and witness: info [at] splitthisrock [dot] org. For more poems, check out the Foreign Policy in Focus article including the poems. From D.C. Poets Against the War (Argonne House Press, 2004). Used with permission. Featured poet Princess of Controversy reads at the Friday open mic. The following is an excerpt from a piece by Phyllis Bennis, Director of the New Internationalism Project at the Institute for Policy Studies, in the Huffington Post, about the escalation in Afghanistan. The full article can be found here"
In a speech like this, widely acknowledged to be setting the framework for the security/foreign policy/military paradigm for the bulk of Obama's still-new presidency, location matters. West Point was crucial partly for tactical reasons (nowhere but a military setting, with young cadets under tight command, could the president count on applause and a standing ovation in response to a huge escalation of an unpopular war). But it was also important for Obama to claim West Point as his own after Bush's 2002 speech there, an address that first identified preemptive war as the basis of the Bush Doctrine and a new foreign policy paradigm. There was an important honesty in one aspect of President Obama's speech. All claims that the U.S. war was bringing democracy to Afghanistan, modernizing a backward country, and liberating Afghan women, are off the agenda - except when the Pentagon identifies them as possible "force multipliers" to achieve the military goal. And that goal hasn't changed - "to disrupt, dismantle, and defeat al-Qaeda in Afghanistan and Pakistan, and to prevent its capacity to threaten America and our allies in the future." So now it's official. It's not about Afghanistan and Afghans at all - it's all about us. The following is an excerpt of Brett McCabe of the Baltimore City Paper's review of Kim Jensen's latest Bread Alone. Kim will be part of a panel on women and war at the Split This Rock poetry festival in March. The full text of the review can be found here. You can hear Kim read from the book this Saturday, Dec. 5 at the Enoch Pratt Library @ 2 pm. The result of this wide-angle focus is a bunker mentality of survival, an attitude of hard-earned daily victories over the malignant forces that feel to have infected many parts of daily life. It's an approach that opens Jensen's poetry up to her subtle shifts and poignant intimations. "The Feast of Sacrifice" begins with the image of Hussein's body swinging from a noose, but concludes in the passive public collusion in the spectacle of heinous acts, where "from the number of hits and visits/ --that people are eager to hear/about all sorts/of disasters." "I still believe/ in the power of words" starts "Rock Bottom," the sort of familiar opening salvo in a screed that might envision poetry's power to change the world, but Jensen twists that expectation by suggesting that it's not her words that are wielding the power: "Isn't it punishment enough/ to endure/ this wreckage of a human/ story?" In her introduction to The Earth in the Attic, Louise Glück says of poet Fady Joudah that he is “the outsider, but a particular outsider, his method less interrogation than identification. …As an Arab in the West, as a doctor who practices emergency medicine, as a poet writing in English, for a number of reasons, in a variety of situations, Joudah finds himself not at home, not among his people.” Outsider does not mean alone, and The Earth in the Attic is populated with others who are not at home, who cannot go home, for whom the very idea of home is in the distant past. The poem, which appears in the third of the book’s four sections, locates exile in violence. For K and his neighbors, exile becomes both a choice and a non-choice. What kind of freedom is there in choosing to remain behind, hidden and wounded by what happens to home? What kind of freedom is there in getting on truck, bound for a destination that the passengers have no say over, where all that is certain is that the Ks who were left behind will haunt them? There is no real staying, and no real flight. War, violent and rapid, forever changes the landscape and the people who lived on it. They will load you in trucks and herd you for a hundred miles. Old men will teach you trade with soldiers at checkpoints. They’ll let you keep your life… . This “you” could be the reader. It is the reader. It must be the reader. And yet, it necessarily cannot be the reader, because who would read this who already knew? The reader is outside the poem, and that is the poem’s power. The reader is outside, and even as the use of “you” pulls her in, it reinforces her outside place. When the poem explains, “Later, they will accuse you of giving up your land,” and the conflict in the poem is erased by power, the reader understands that she is part of both the power that lies to justify war and murder and of the people who are erased. The reader’s outside relationship to the poems is not allowed to be that of just a detached observer. The Earth in the Attic is unrelenting in reminding readers of the outsider, including poets in this complex way of being in the world. In “Pulse 15,” Joudah writes of running through the rain with a fellow aid worker, being thought mad by the children who usually shout after them on dry days. The speaker seems to enjoy the peaceful moment, but knows that the way the children see him matters more than the way he sees them. The speaker hopes that one of them “is a poet/ Who will write the two strangers/ In one of his famous pieces/ For who we really are. . ./ And we would call it even.” Writing these children, writing these lives, can never be sufficient. It can never be free of the power that comes with the ability to enter these places, help, and leave, as all “humanitarian men” must do. But when Joudah hopes that the children will write their own poems, he acknowledges that words have power to shape truth. The Earth in The Attic reminds us to hear the truth of those displaced by war. Fady Joudah will be featured at Split This Rock Poetry Festival: Poems of Provocation & Witness, March 10-13, 2010, in Washington, DC. The festival will present readings, workshops, panel discussions, youth programming, film, activism—four days of creative transformation as we imagine a way forward, hone our community and activist skills, and celebrate the many ways that poetry can act as an agent for social change. For more information: info at splitthisrock dot org. Katherine Howell is a poet, the Communication and Development Assistant and Blog Goddess for Split This Rock, and a Lecturer in Writing at the George Washington University. She lives, writes, and teaches in Washington, D.C. You can read her reviews of Split This Rock featured poets here. tissue, like something that could tear. Afterward, I waited in the corridor. When I came back, he was alive and breathing. Here, let me rub your back, I said. Was it true what I’d heard, that the soul resides in breath? from his shoulders. I rubbed his back. he said. I don’t need to be burnished yet. Excerpt from “Nights of 1990” from Ghost Letters (1994), used by permission. Richard McCann is the author, most recently, of Mother of Sorrows, an award-winning collection of linked stories that Michael Cunningham has described as "almost unbearably beautiful." He is also the author of Things Shaped in Passing: More 'Poets for Life' Writing from the AIDS Pandemic. His work has appeared in such magazines as The Atlantic, Ms., Esquire, and Tin House, and in numerous anthologies, including The O. Henry Prize Stories 2007 and Best American Essays 2000. For his work, he has received awards and fellowships from the Guggenheim Foundation, the National Endowment for the Arts, the Christopher Isherwood Foundation, and the Fine Arts Work Center in Provincetown. A professor in the MFA Program in Creative Writing at American University, McCann serves on the Board of Directors of the PEN/Faulkner Foundation and is a Member of the Corporation of Yaddo. McCann will be featured at Split This Rock Poetry Festival: Poems of Provocation & Witness, March 10-13, 2010, in Washington, DC. The festival will present readings, workshops, panel discussions, youth programming, film, activism—four days of creative transformation as we imagine a way forward, hone our community and activist skills, and celebrate the many ways that poetry can act as an agent for social change. For more information: info@splitthisrock.org. Seeks poems of the topic of women, around the world and in the USA, fighting for freedom and justice even when it puts them at risk or imperils their lives. Women around the world and in the U.S. who are fighting for freedom and justice, even when it puts them at risk or imperils their lives ......what are the causes that command their attention and fuel their passion?.....what causes and movements bring them to step beyond themselves and stare down danger, despite the potential for personal harm? If the guidelines aren't followed, the work won't be read. 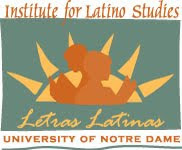 "Bittersweet Harvest: The Bracero Program, 1942 - 1964"
serves as the Executive Director of the Capitol Letters Writing Center. Until recently, she was Senior Writer and Editor for a communications company that specializes in public health education. Ayala also teaches at The Writer's Center in Bethesda, MD and is the recipient of numerous awards for her work. A third book of poems is slated for publication with Bilingual Press. John Olivares Espinoza is the author of The Date Fruit Elegies (Bilingual Press, 2008), the inaugural collection in the new poetry series, Canto Cosas. In 2009, the book was a finalist for the Northern California Book Award. Espinoza was born and raised in Indio, CA to Mexican parents. He holds degrees in creative writing from UC Riverside and Arizona State University (MFA), where he spent time writing about his experience working as a gardener with his father and brother. John and his wife live in San Jose, CA, where he teaches at the National Hispanic University. Split This Rock Volunteer Party: RSVP by Tomorrow! Want to get involved with Split This Rock? Not to worry, there's still room left for our December Volunteer Party this Friday December 4th, 2009 6:30-8:30pm. Please join us for refreshments, poetry and jolity! If you are interested in joining the Split This Rock team, this is a great way to meet other volunteers, board members, staff, and poets. And if you have worked with us before, we look forward to seeing you again! 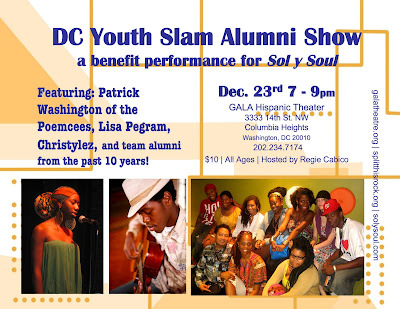 Please RSVP with our Program Associate, Abdul Ali at ali at splitthisrock dot org by Thursday December 3rd, 2009. Last Wednesdays of the month. Come early to browse & chat. An open reading will follow. Free. On Wednesday, 2 December 2009, 7 pm, Greg McBride and Lyn Lifshin will read their poetry. Greg McBride, a Vietnam veteran who practiced law for 30 years, edits Innisfree Poetry Journal. His work appears in Cimarron, Connecticut, Gettysburg, and Southern Poetry Reviews; New York Quarterly, Poet Lore, and River Styx. He won Boulevard's 2008 Emerging Poet Prize, and has a 2009 chapbook, Back of the Envelope. Lyn Lifshin is the author of the germinal "No More Apologizing" proclamation, editor of the mother-daughter Tangled Vines anthology, and subject of an award-winning documentary film, Not Make of Glass. Her 120 books include Marilyn Monroe, Blue Tattoo, the Ruffian and Barbaro race-horse books, and three Black Sparrow books, Cold Comfort, Before It's Light, and Another Woman Who Looks Like Me. On Wednesday, 27 January 2010, 7 pm, Bonnie Naradzay, Lee Giesecke, and Nancy Allinson will read their poetry. They are members of the Federal Poets, the Metro area's longest running workshop, which publishes The Federal Poet. The following is an excerpt from the Capital Comment Blog's Washington Read's review of Randall Horton's new book The Lingua Franca of Ninth Street. Toss aside your notions of poets swooning over starlight on windswept hillsides. The props in Randall Horton’s poems are razor wire, cigarette butts, and cinder blocks, the haze of weed smoke, the stripes of memory. His new collection provides a haunting and memorable tour of alleyway DC, a place where leaves falling to littered sidewalks cry out “dear mercy.” A broken place where words are the only splint. Randall read at Sunday Kind of Love in October and he'll be back to read again at the Split This Rock Poetry Festival in March.